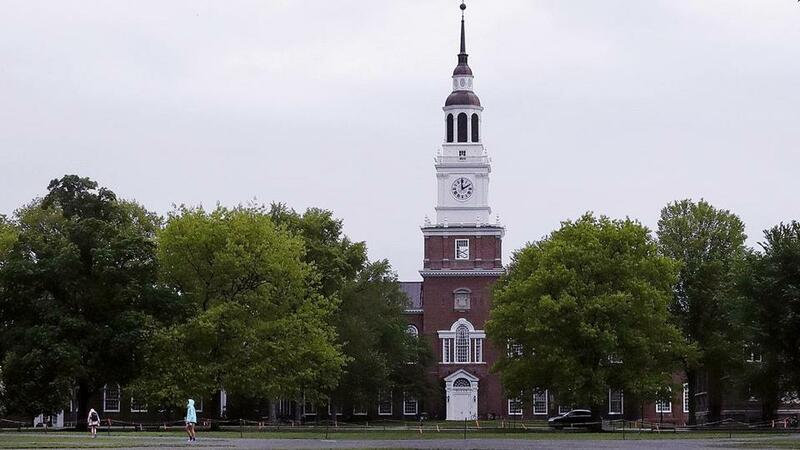 After sexual harassment case, what’s next for Dartmouth College? A pending lawsuit accuses Dartmouth College of failing to protect its female students. Following a lawsuit accusing Dartmouth College of failing to protect women from sexual assault and harassment, many students, faculty, and alumni fear administrators have not yet reckoned with a culture that allowed what the plaintiffs called a “predators’ club” to flourish on campus. A group of alumni and students is seeking more training for staff, greater transparency about sexual harassment incidents, and more robust mental health counseling for victims of sexual harassment. The group collected more than 800 signatures on a letter demanding that the college’s president, Philip J. Hanlon, and the board of trustees ensure that people are held accountable and practices overhauled as a result of the lawsuit’s allegations. It plans to send a letter to college administrators this month, outlining proposed changes. Hanlon has promised a “sweeping plan” that will be unveiled in January to combat sexual assault. Seven current and former students say former professors groped students in plain sight, hosted hot-tub parties with students, openly debated who had the “hottest lab,” and sexually assaulted grad students. “Dartmouth is redoubling its efforts to ensure that every member of our community can thrive in an environment that is safe, welcoming, respectful, and inclusive,” Hanlon said in a recent e-mail to the Dartmouth community. The sexual misconduct case has dogged the college for more than a year and a half and is likely to remain on the front burner in 2019, as the Ivy League school in Hanover, N.H., celebrates its 250th anniversary with commemorative events and a fund-raising push. On social media and in private conversations, alumni have expressed frustration and threatened to withhold donations over the handling of the case. The New Hampshire attorney general’s office is conducting a criminal probe into the sexual misconduct allegations. According to the lawsuit, filed in November, three former neuroscience professors groped female students in plain sight, hosted drinking and hot-tub parties with students, openly debated who had the “hottest lab,” and allegedly sexually assaulted students they were supposed to be training. “These professors leered at, groped, sexted, intoxicated, and even raped female students,” the plaintiffs, who are seeking $70 million in damages, allege. The professors, Todd Heatherton, Paul Whalen, and William Kelley, were influential in Dartmouth’s brain science department for two decades and exercised tremendous control over their students’ academic careers — delaying exams, withholding advisory meetings, and threatening the research and funding of women who shunned their advances, according to the lawsuit. All three professors left Dartmouth last year after the college conducted a months-long investigation. Heatherton retired; Whalen and Kelley resigned. Heatherton has said that he acted “unprofessionally while intoxicated” at several public events and has apologized for his behavior. Whalen and Kelley have not responded to requests for comment. The students allege that administrators should have done more to police faculty behavior and had received previous sexual harassment complaints against two of the three professors. And administrators in the psychology and brain sciences department had previously heard from students that they felt pressured to drink and socialize with the professors and had observed them “blurring professional boundaries,” according to the lawsuit. Dartmouth plans to file its response to the allegations in mid-January, according to college officials. But Hanlon has stressed in e-mails to the Dartmouth community that the college took unprecedented steps after its own investigation and was prepared to revoke tenure from the three professors. Dartmouth officials declined to comment on specific changes the college plans to make regarding sexual misconduct, but a committee has been working on recommendations for more than a year. “Dartmouth’s senior leaders join me in making a commitment to take the steps necessary to succeed and lead in this vital endeavor,” Hanlon said in his recent message. Dartmouth administrators have made such commitments before, said Steve Kelly, the attorney for the seven women suing the college. “Meaningful change will require Dartmouth to truly listen to victims of harassment, to acknowledge and accept full responsibility for their injuries, and to work with victims, experts, and the Dartmouth community to engage in a true cultural shift,” Kelly said. The college should be frank about what happened in the case and how such behavior continued for years, said Jennifer Groh, a former Dartmouth professor who now teaches at Duke University and was one of at least 27 people who participated in the college’s sexual harassment investigation. Groh said there must be a way to share the findings while protecting the identities of victims who don’t want to be named. Dartmouth did not inform students or faculty when the professors were abruptly removed from campus in 2017, and details of the allegations remained a mystery until the November lawsuit. The college should also create an independent oversight group to review academic decisions involving any students who may have complained or been affected by the three professors, to guard against retaliation, Groh said. The lawsuit names several senior members of the psychology department who allegedly did little to curtail the misconduct, Groh said. Alumni and current and former faculty also say that Dartmouth needs to take a closer look at how it rewards faculty and whether decisions to grant tenure are fair. Despite complaints about groping involving Heatherton more than a decade ago, he was promoted and received a prestigious award. Heatherton has said that the college investigated that incident and determined the touch was accidental and not sexual. During the time of some of the alleged misconduct, Dartmouth’s brain sciences department had only three tenured female professors and at least 11 tenured male professors. The lack of senior female faculty made it difficult to speak out about the behavior, some of the students who have filed the lawsuit said. Dartmouth officials have pointed out that men and women who qualified for tenure have been offered it at a similar rate. Over the years, some female faculty left Dartmouth after receiving tenure, while several junior female professors departed before their tenure decisions came up for review. Dartmouth is also working on some of the changes proposed by alumni and other groups. For example, about $17 million of its current $3 billion fund-raising campaign is earmarked for expanding mental health services, according to the college. Faculty who are part of Dartmouth’s chapter of the American Association of University Professors and alumni said they will keep watch to ensure that Dartmouth makes meaningful changes to its culture and practices. “We are in it for the long haul,” said Whitney, the spokeswoman for Dartmouth Community Against Gender Harassment & Sexual Violence. can be reached at deirdre.fernandes@globe.com.